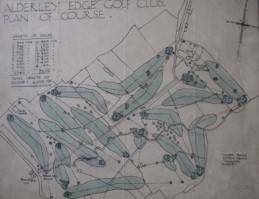 A question that is often asked at Alderley Edge is: "has the club ever sought to extend to 18 holes ?" Well, the answer to that is definitely "Yes", and in fact on more than one occasion. The most notable opportunity which the club had came in 1928. There appeared to be a chance of acquiring the ‘Upper Meadow’ of Stockton Farm (the field which now comprises the playing field and the meadow beyond) and the Committee’s resolve would appear, on the face of it, to have been considerable, for they engaged five times Open champion and prolific course architect James Braid to view the land and present preliminary designs. Braid is credited with over 300 course designs and rebuilds in the United Kingdom, and was considered to be in the top echelon of course architects alongside Harry Colt and Alister McKenzie. The ex Captain, Mr Tom Thorniley, made the generous offer of meeting Braid’s fees, which totalled £15.1.0. A considerable sum when one considers that the annual subscription at the time was £4.4.0. No mention was made of this project, even at the next AGM, but if the Committee intended to keep the project a secret, it would have been extremely difficult to have a five times Open champion, no doubt wearing his trademark bunnet style tweed cap and Norfolk jacket, wandering around the course and adjoining fields unnoticed ! That the committee very shortly after this decision resolved to extend the clubhouse is perhaps indicative of other priorities. If the club ever had a perfect opportunity to extend its course to 18 holes, it had just rejected it. 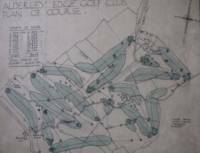 The subsequent development of the surrounding land in the 1950s and 1960s, into what we now know as Links Road, Welton Drive and Chesham Road, effectively extinguished any realistic opportunity of extending Alderley’s course to 18 holes. The plan was revealed to the members some time after Braid’s visit, and was no doubt viewed in the context of “what might have been”. There have been subsequent, but not always entirely serious, considerations of extending the course on to Hole Farm and parts of Stockton Farm, the latter being designated as potential golf course in the Wilmslow town plan of the 1960s. The club sought, in the early 1970s, to have Macclesfield Council acquire this land and lease it to the club, but a change in government funding priorities scuppered this.